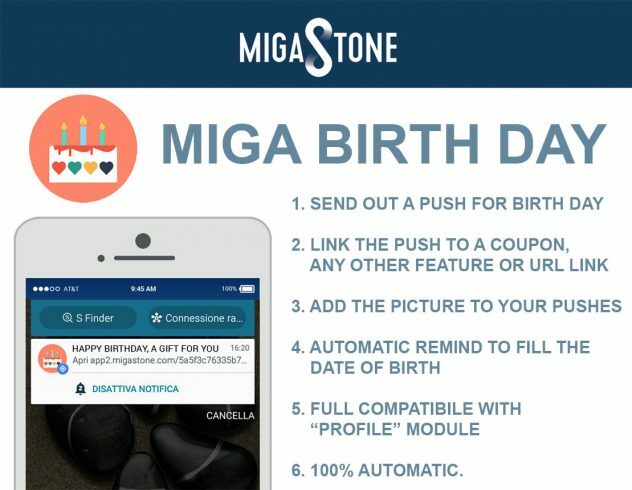 MIGA BIRTH DAY is a simple module that allows to manage automatically the BIRTH DAY notifications. You will get within 1 working day from the purchase a LICENSE CODE, sent by email, to activate your module in the ADMIN backoffice >> Manage >> Modules section. Get happy customers by remind their birth day, send out a nice offer or coupon as a present. Setup the HAPPY BIRTH DAY PUSH NOTIFICATION. This is the notification that the system is sending out automatically when there is the birth day of the users. Fill the fields of a standard push notification as you want. TITLE, MESSAGE TEXT, URL or FEATURE LINK and the IMAGE.TIP: If you want to add a Coupon that is visible only for the recipient of the Happy Birth Day Push, just create a COUPON feature, disable it BUT link it to the push. 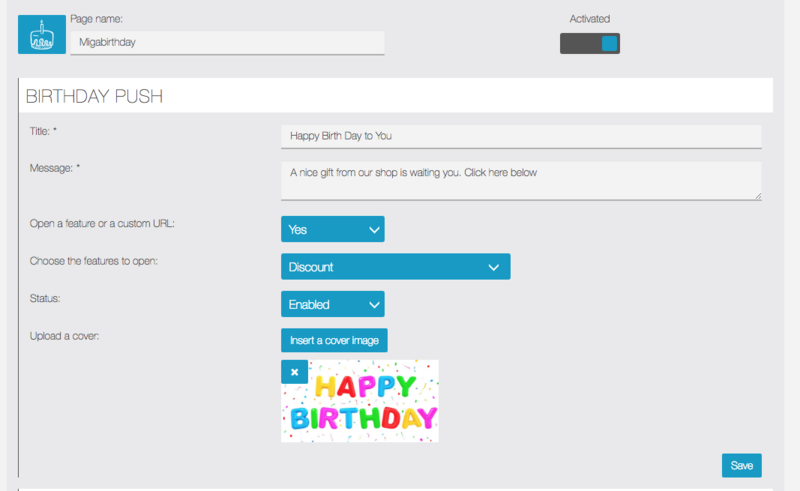 The result is that the COUPON feature is accessible only from who got the Happy Birth Day Push and clicked to the link. The invitation push is sent from the system only to the users that are registered to the APP but they didn’t fill the DATE OF BIRTH. The system will remind the user to provide the date of birth for 3 times on a weekly base. Select witch is the DATE OF BIRTH (DOB) Field we should use. The module is able to work alone with the MIGABIRTHDAY data base or if it is present the optional “PROFILE” module is possible to select the field of PROFILE module as the DATE OF BIRTH. After you setup the module the system will start to work for you 24/24h every single day ! What is happening if I change the Date of Birthday (DOB) Field from MIGABIRTHDAY to PROFILE in the future? 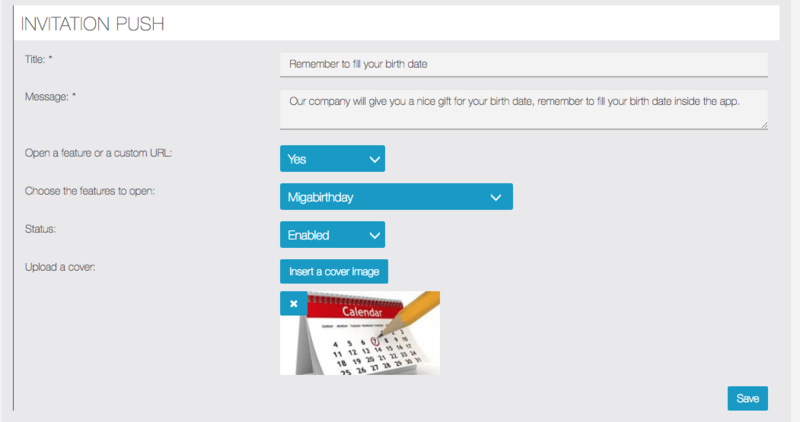 Simple the system is using the date of birth set in PROFILE module and will ignore all the DATE OF BIRTHS already entered in the MIGABIRTHDAY feature in the past. 8.0.0 Fixed translation MONTH. Added one option to decide how ofter the reminder is sent. Added an option to enable and disable the Siberian Cron and use the manual URL cron. 7.0.0. Replaced the DatePicker, fixed popup translation, Fixed a Profile Module issue.